My day starts with welcoming children and parents at 8:45am. to start their school day. We head straight to the classroom for our morning Montessori three-hour ‘work’ period. During this time I guide the children into working on individual learning materials with the help of my classroom assistant. After this morning period we head to the canteen where we all have lunch, during which time the children help with laying the table and cleaning up. Then they have afternoon outdoor playtime / music / gym / nature / gardening / art type activities with the other staff while I catch up on administration and management work, before meeting parents at pick up time, normally at 3:30pm. Then it is time to clean up and prepare for the next morning's classes! What is Albufeira like? What are the pros and cons of the local area? Albufeira is a very friendly medium-sized town that is close to the sea. This means a lot of people come on holiday here and have moved here over recent years to enjoy the weather, lifestyle and friendly community. We enjoy year-round good weather and there are lots of great facilities for children (parks, beaches, international schools etc.) as well as shops, a shopping center and many events during the year. The only downside may be that in the summer it gets quite busy with a larger number of visitors then normal, but this influx of visitors is great for the local economy. Eden is a new school; what prompted the decision to open a Montessori school here in Portugal? Being a play therapist and teacher, I had explored many education methods and found Montessori resonated with me the most for various reasons. One of my motivations is I have a daughter who is four years old. I wanted her to have the best education possible and after a lot of research decided on the Montessori method, subsequently carrying out all the relevant training with the Association Montessori Internationale (AMI). 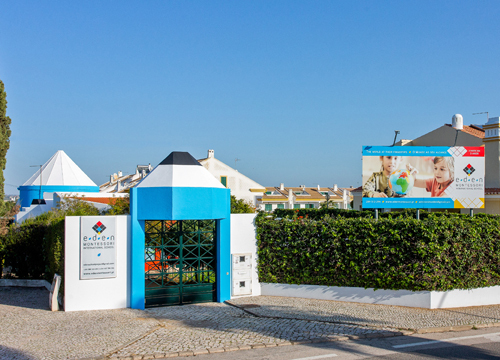 We are one of three Montessori schools in Portugal – the other two are in Lisbon and Porto (opening soon) and we are the only one in the south. I am passionate in knowing Eden can provide a new, unique and amazing education opportunity for many children in Portugal and have put everything into creating this school over the last three years. Tell us about the Montessori style of education and how it differs from other approaches. Montessori is a sensorial learning process using all seven senses - it is an active learning environment where children engage with learning materials freely and are not expected to just sit still and listen to the teacher. Learning is self-paced - children are not all doing the same thing at the same time and Individual learning needs are catered for. Children have the freedom to choose what activities to do each day from a wide range of possibilities. As long as a child knows how to use the particular materials they are free to practice with them for as long as they choose. There are 3-hour work periods instead of block class times (30 min, 60 min etc. ), enabling children’s concentration to develop and “work” to happen and flow naturally over a longer period. The children are in multi-age classes, working alongside one another and allowing children to work at levels higher, lower or equivalent to their own ability levels. The physical layout of the room fosters independence - children are free to access materials and go about their work with little help from anyone. They are encouraged to be independent in self-care activities (dressing etc.) and care for the environment they are in (putting away materials and their work etc.). Finally, there is freedom within limits in a Montessori classroom. It may seem that the less restrictive schedule and honouring of children’s choices can result in an unstructured classroom but to the contrary Montessori environments carry appropriate well-researched expectations and allow children to develop their own internal structure over time. What age groups does your school cover, and what are the class sizes like? We have two classes – Children’s House (ages 3-6) and Lower Elementary (ages 6-9). We have a limit of 21 children in each classroom and with the amount of interest for the 2019 / 2020 year we are expecting to be at full capacity. Do you see a lot of international pupils at your school? How does Eden Montessori cater for the needs of expat children? We mainly have expat children – we currently have students from Norway, Sweden, France, South Africa, the USA and the UK. We speak both English and Portuguese in the classes so children will always be able to communicate in one language or the other. One of the Montessori foci is on learning about different cultures and there are therefore learning materials, activities and discussions created specifically to help understand each others cultures better. The primary language is English, but the school is bilingual (English and Portuguese) and a few expat children have learnt English from scratch in their few months here. What extracurricular activities are available at Eden? We currently offer yoga and dance classes as our extracurricular activities, and spend a lot of time outdoors in a natural playground with a sand pit, outdoor kitchen and climbing frames; and we provide a lot of active, creative and Forest School activities. I enjoy spending time with my husband and daughter, taking trips to the beach or to my husband's family's farm. I love to hike and go on nature trails and travel to interesting places whenever possible. You can find out more about Eden Montessori on their website.